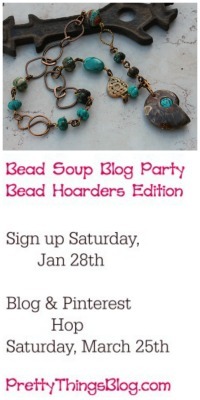 Well it's that time again -- the end of the month and the end of my Cup of Bead Soup, this month with ceramic artist Spirited Earth. 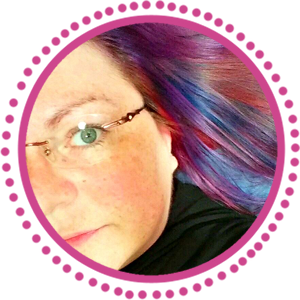 It's been a fabulous month that has truly pushed me, having me work in more muted palettes, pulling out the liver of sulphur, trying out a graphic designer's color book ... it's been a wonderful experience! I'm ending out the month with a special piece that I made for myself. I've been needing a long necklace to wear with sweaters in the winter, and wanted something in pastels. So I pulled out Nan's aqua heart that I'd been hoarding all months and began. To make the double prong at the top of the bead, I ran two pieces of 20 gauge wire together and created ONE wrapped loop for the bottom of the bead. I then ran the two wires up through the top, made a loop up high, and wrapped the neck down about six times. That gave me the links I needed to create the profile I wanted. For the bottom of the pendant, I used a Hip Chick Beads sterling charm that says "Just Be You". This will remind me to focus on being true to me, to not worry that I'm not perfect, to just be the best person I know how to be, and that everything should turn out OK if I do that. The ceramic heart reminds me to love myself for me, and to not try and change who I am to fit a mold I don't fit into. This necklace is also special to me because I made the majority of the beads. I made the necklace with no clasp -- it's just long enough to put over my head with no trouble. The square bead between the two aventurine leaves marks the center back of the necklace. I'm super-pleased with this piece, and think it's a great one to end the month with. I'm incredibly grateful to Nan for her artistry and talent. I hope you've been inspired by her work, and will stop by her store soon! yummy, Lori...that is just beautiful! Love it - great colors. long necklaces are such fun! Ah, this is beautiful. When I first looked at it I thought this is a perfect blend or bridge between some of your earlier work and what you are doing now to challenge yourself in new directions. I've really enjoyed seeing how you've worked with Nan's pieces. I hope you'll continue this series of work. 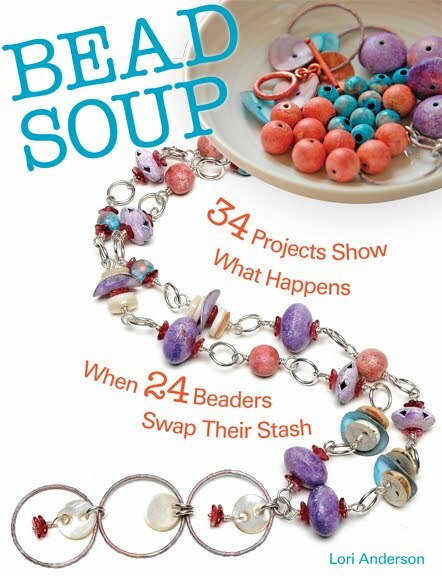 I love this cup of bead soup! The pastel colors are wonderful. Thanks for sharing. Wonderful. I love this feature. Keep doing more! Very pretty Lori, looks like it is dripping with juicy color, the transparencies in the beads are awesome with the Nan's work! Gorgeous! Those colors are beautiful. Very pretty. wow i so love this piece..and it's especially nice that it incorporates so many of your own lovely beads..
this has been so much fun for me to watch you create with my ceramic beads..
Lori, Your work is amazing! Thank you for sharing! What a special and beautiful necklace for a special and beautiful person! Wow. I love long necklaces. I think it is great that you'll be keeping this one for yourself, after all, it is full of special components...the words of inspiration, and YOUR own lampwork beads! This one is beautiful, Lori! 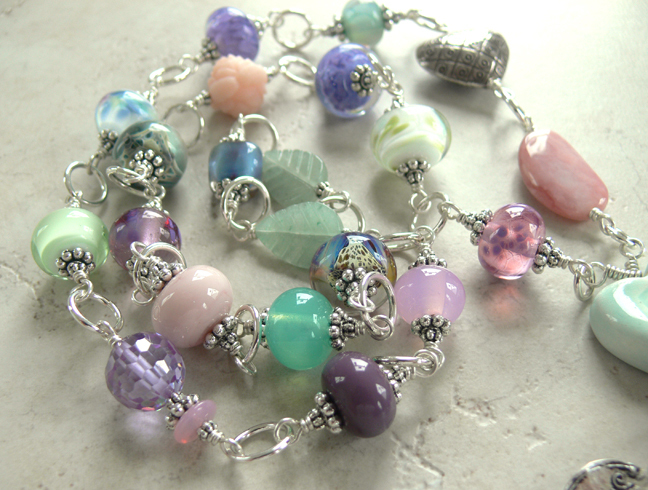 Very lovely compilation of pastel colours and gorgeous beads! Oh Lori all the pieces from Spirited Earth were amazing! This one is stunning and having first hand knowledge of your wire work I can see how much you put into this! Note to all~ If you want a piece of jewelry with wire in it Lori is the girl for you!!! 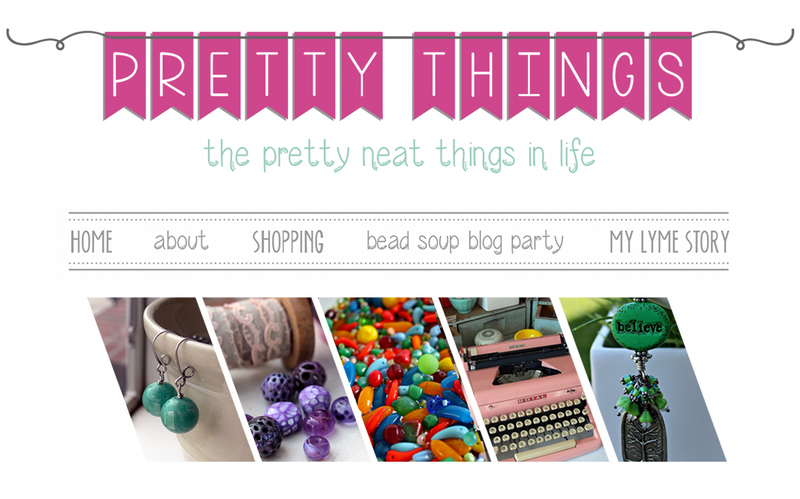 I have seen a lot of jewelry and her work is put together fabulously! Lori, this is just a lovely necklace, it is so nice to be able to create and wear something that you have actually made the beads yourself. I love it! One day I want to own a store and I would love to have your jewelry pieces in it. 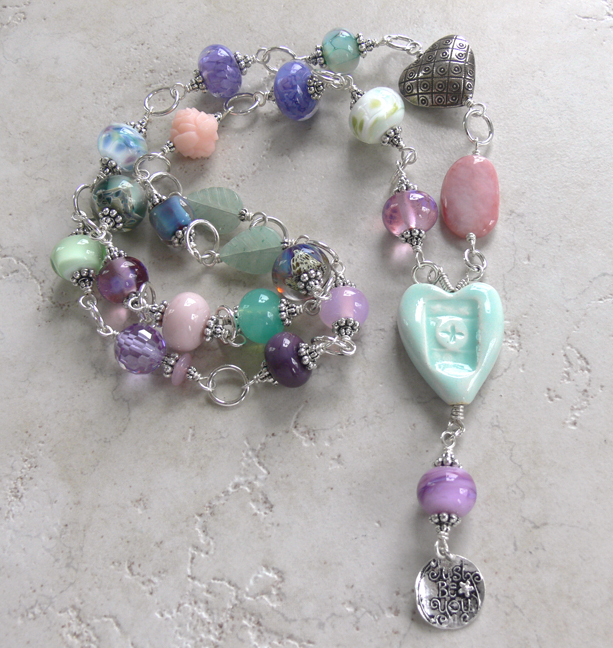 Lori, you've created a gorgeous necklace--the beads are spectacular! I love the special reminders you've added and would have to say this piece truly reflects lots of love!! This is just fabulous! I love the pastel color palette! I love all the thought and meaning that you imbued in this necklace. I have some beads from Nan, too, and you have inspired me to get busy with them! I think it is wonderful that you are using ceramic beads in your work. 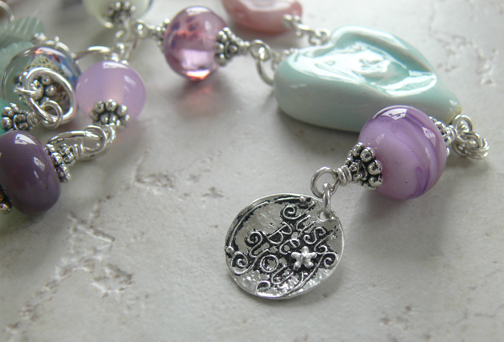 I enjoyed the interview about you today on the Beads-of-Clay Blog. Lovely pieices all of them. I have also enjoyed learning about your educational adventures with your young son. I think having a child happy and challenged in school is number one on my priority list as a parent. I am gald you were able to accomplish this. And lastly, thank you for stopping by my blog and commenting. Most appreciated. A Book Giveaway -- Choose Your Own Book!